Sharecare (Twitter Handle @Sharecarenow) created by Jeff Arnold, founder WebMD and Dr. Mehmet Oz, a leading cardiac surgeon, health expert and Emmy-award winning host of “The Dr. Oz show” is an interactive, social Q&A platform designed to greatly simplify the search for quality healthcare information and help consumers live their healthiest life. Sharecare collectively brings together top leaders in the health care industry to provide consumers with multiple perspectives within a single website dedicated to improve health and wellness for healthier lives. Sharecare is in partnership with Harpo Studios, Sony Pictures Television and Discovery Communications. 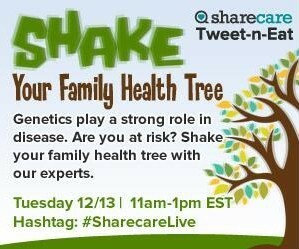 We hope you will be able to join us for Sharecare’s twitter chat on Tuesday, December 13, 2011. Ask us a question about your family health history and we will answer you. Some of the outstanding content partners on Sharecare include: National Institutes of Health (NIT), The Centers for Disease Control and Prevention (CDC), The American Dietetic Association and the Pharmaceutical Research and Manufacturers of America (PhRMA), Columbia University Department of Surgery, American Society for Gastrointestinal Endoscopy, Weight Watchers®, and Piedmont Heart Institute. Some of the outstanding lead content contributors on Sharecare include: AARP, American Cancer Society, American, Chiropractic Association, American Diabetes Association, American Heart Association, American Red Cross, National Academy of Sports Medicine, Sigma Theta Tau and HealthCorps.